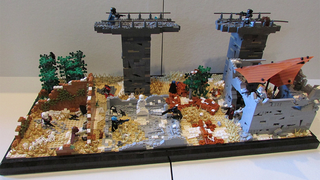 Inspired by the game’s original concept art, LEGO enthusiast Hunter Erickon rebuilt a tiny segment of the toxic, burnt grass area of Destiny with LEGO bricks. His set features rusted cars, a destroyed highway bridge, and a 6v6 battle between two Hunters, two Warlocks and two Titans in the ruins of modern day Kazakhstan. Gotta love those custom Destiny minifigs!